Real Madrid forward, Karim Benzema, has spoken about the departure of Cristiano Ronaldo, claiming that he is happy to function as the leader of Real Madrid's attack this season. Benzema is the leading scorer for the Spanish giants so far this season with 20 goals in all competitions. There is no doubt that he has rediscovered his goalscoring touch after enduring a tough 2017/18 season, which saw him score just 12 goals in all competitions. The 31-year-old has been a terrific player for Los Blancos over the years despite his inconsistency in front of goal. Benzema has scored over 200 goals for Madrid since his arrival at Santiago Bernabeu 10 years ago. On the other hand, Real Madrid's greatest ever player, Cristiano Ronaldo, joined Juventus this past summer after winning three consecutive Champions League titles with the club. With 19 goals and 8 assists, Ronaldo has taken the Serie A by storm, but has left a huge void at his former club; one that is yet to be filled. 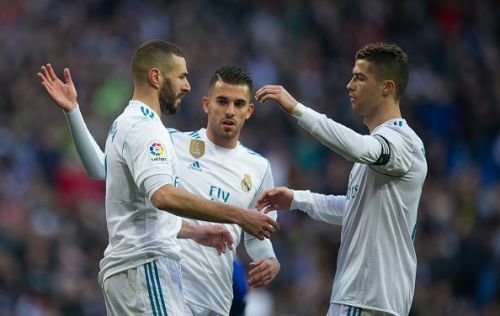 Benzema has now revealed that in order to provide for Ronaldo, he played more selflessly in the previous seasons but is now happy to play the leading role in Los Blancos' attack. In an interview with France Football, Benzema said, "Before, there was a guy that scored more than 50 goals a season and I was in the role of a passer. Except that I had the No. 9 on my back. I didn't play centre-forward in fact, in spite of my position. I played in terms of Cristiano. We formed a great duo. I looked for him constantly with the aim of helping him score even more goals. I was in a secondary role." "When I came to Madrid, I had to change my way of playing. I put myself at the service of a guy who -- I say again -- scored 50 goals a season. And it was a pleasure to play with him. Now, I'm the leader of the attack. It's up to me to make the difference. I am very happy, because I can play my true football." Real Madrid will host FC Barcelona twice in the coming week, once in the Copa Del Rey and then in LaLiga, and the onus will be on Benzema to ensure his side are firing on all cylinders up front.